I love salad. 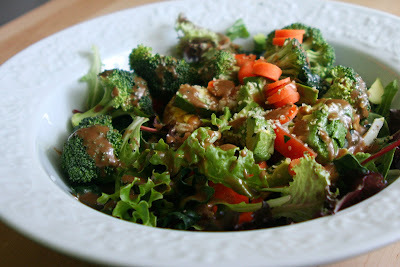 I could seriously DRINK my balsamic vinaigrette dressing (below). I love it that much. I’ve been trying to eat a lot cleaner lately (no refined sugars or flours)…basically eating raw until supper. Fruit for breakfast and snack and I’ve making a huge salad like the one above nearly everyday for lunch. Eating greens will really help curb sugar cravings…try it! I’m so excited for the Farmer’s Market to begin so I can get some local, organic greens and veggies. Oh the joy! Here is the dressing recipe again. I usually make a double batch and it keeps for at least a week, if not longer. Just add a little water each time you use it and shake. 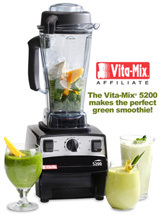 In a blender, blend all ingredients until smooth. Store in a glass jar in refrigerator. Keeps for 3-4 days. To re-use, add a little water and shake. This looks DE-LISH! Thanks so much for posting again! I love all the pictures you have here on this food site. It’s inspirational…so I’m off to the kitchy now, lol. And I’m so excited about the Farmer’s market too, ours starts this next weekend in Lincoln! Yahoo! You’ll have to post some photos of yours there in Montana! Thanks for the yummy post! I just blogged about salads recently too. I love to get a lot of different colors and textures going on. Sounds like you did that with this one! Yum! I love salads too, but have no imagination when it comes to making them, so I’ll get all determined and buy some green leafies, and then they will sit in the bottom of my fridge until they become brown and slimy and I have to give them to the chickens. I think I will copy down your list and use it like a recipe– because I’m that uncreative and need help! Just made a mini-cookbook from some of the recipes on your blog. Took this salad list to the store yesterday and made a yummy salad for dinner. I think I had enough veggies for two days, but can’t wait until lunch today for another. Couldn’t make the dressing, some of those ingredients aren’t here in my neck of the woods. But, I can get Annie’s Green Goddess dressing, Yum! yum yum! i’ve been in a salad rut lately. and been craving them with this warmer weather! i’m going to try this one. sounds delish. Oh, that salad looks great, Sara. I love salads. I usually eat one a day. I am anxious to try your dressing; looks good. Our farmer’s market opens on Saturday and I can’t hardly wait. About the ingredients…you can omit the miso and nama shoyu is basically soy sauce. Other than those 2 things…the ingredients can be found anywhere. Hope that helps 🙂 Also, sometimes I leave the parsley out if I’m not going to be using it right away…but it adds a great flavor. I was also wondering about the miso and nama shoyu, so thanks for answering this already! Can’t wait to try it. Hi, Sara! That looks yummy. I’ve been juicing in the morning, then fruit when I’m hungry, and a big salad for lunch. It give you so much energy, and is so satisfying. Thanks for coming to our meeting this morning! what a great looking salad..i could drink that salad dressing as well. I tried this dressing and am totally hooked. Yum! I don’t like store-bought dressings so am always on the lookout for great homemade ones. This one’s a keeper!